The Green Bay Packers (2-1-1) will visit the Detroit Lions (1-3) @ Ford Field this Sunday at 1 PM EST. You can catch the action on FOX and through Detroit’s radio waves on WJR-AM 760. Last Sunday, the Lions dropped on the road in Dallas while the Packers took care of Buffalo at home. Heading into the match-up with Dallas, Detroit’s defense knew that they were going to have to stall Ezekiel Elliott somehow, someway if they were going to have success. Well, they didn’t come close. Green Bay doesn’t have a back like Elliott, but that still doesn’t change the fact that the run defense in the Motor City hasn’t been good. In fact, prior to last Sunday, Detroit ranked 32nd in the league on stopping the ground attack. For Green Bay, Aaron Jones and Jamaal Williams will get most of the workload. Jones ran 11 times for 65 yards with a touchdown as Williams had the same amount of carries for 27 yards in their victory over the Bills. Detroit is much better at defending the ball through the air. Despite a lingering knee injury to Aaron Rodgers, he’s going to test the Lions’ secondary, especially with Davante Adams and Geronimo Allison. Rodgers targeted Adams and Allison a combined total of 25 times a week ago. After allowing 83 points in their first three games, the Packers found a way to blank the Bills. This Sunday, things will be more difficult for Green Bay’s defense. Matthew Stafford and his offense are averaging 390.5 yards per game, good for 11th best in the league. On average, Detroit is putting 23.5 points on the board as Green Bay places 23 up per game. Four players have already been ruled out for Sunday’s game in Detroit, three Lions and one Packer. Randall Cobb (hamstring) is out for Green Bay. Ziggy Ansah (shoulder), T.J. Lang (concussion) and Michael Roberts (knee) are out for Detroit. Questionable for the Packers’ offense: WR Davante Adams (calf), WR Geronimo Allison (concussion), G Justin McCray (shoulder) and G Lucas Patrick (back). For Green Bay’s defense: CB Jaire Alexander (groin), CB Breshaud Breeland (hamstring), S Kentrell Brice (ankle) and S Jermaine Whitehead (back). Detroit’s only questionable player on offense is WR Marvin Jones Jr. (ankle). Questionable Lions on defense: DB Quandre Diggs (hand), DL Da’Shawn Hand (ankle), LB Eli Harold (Not Injury Related), CB Nevin Lawson (illness), DB Tracy Walker (ankle) and S Tavon Wilson (back). Needing a win, Detroit tops Green Bay, 27-24. Last week there was a lot of frustration among Chicago Bears fans despite a win in Arizona. Quarterback and 2nd overall pick Mitch Trubisky had another mediocre game as he missed a lot of open targets. The young North Carolina alumn did a complete 180 on Sunday against the Tampa Bay Buccaneers. Six touchdown passes, 354 passing yards (19/26), 154.6 passer rating, 53 rushing yards and a 48-10 victory. It was his 16th start in the NFL, so he now has a season-worth of starts in his career going back to last year. His six touchdown passes in one game are far and away a career-high and his 354 passing yards was also a career-high and just the second time he has surpassed 300 in a game. In fact he had seven touchdown passes all last season (12 games) under John Fox. Everything was working for him. He was throwing the deep ball very well and accurately, which was good to see because he had plenty of wide-open targets down field. He also got the Bucs to jump off-sides a few times, used his athleticism on a few nice rushing plays and just looked much better in the pocket than last week. Also worth noting he did not turn the ball over. There were a few overthrown and underthrown balls, but his good outweighed the little bad by a lot. As Trubisky dominated, the rest of the offense worked like a symphony in perfect rhythm. Great blocking all around allowed for Trubisky to have time to throw and set up some nice screen passes. Tarik Cohen led the way in receiving yards with with 121 with Taylor Gabriel at 104, who also caught two of the six touchdowns. Other touchdown passes were caught by Cohen, Allen Robinson, Josh Bellamy and Trey Burton. Bears will head into a bye week next week before heading to Miami. The Detroit Lions (1-2) are making the trip to Arlington to face the Dallas Cowboys (1-2) @ AT&T Stadium. You can catch this one on FOX and through Detroit’s radio waves on WJR-AM 760 @1 PM EST. Last Sunday was good for the Lions, but not so good for the Cowboys. Detroit took down Tom Brady and the Patriots on Sunday Night Football after Dallas fell to the Seattle Seahawks on the road. Slow starts have been the early storylines for both teams. Matthew Stafford and his offense got things going last Sunday, where as Dak Prescott and Co. are still trying to get the wheels moving. A once dominant offensive line in Dallas has turned into a weak link this season. Coming into the season, PFF (Pro Football Focus) ranked Dallas’ offensive line as the second best in the league. Through three games, Prescott has been sacked 11 times. The 25-year-old quarterback has yet to throw for 200 yards this campaign. Ezekiel Elliott on the other hand, is rumbling away. Elliott rushed for 127 yards last week on 16 carries and is tied for most rushing yards this season. Detroit’s run defense isn’t quite where they would like it. Coming into this match-up, the Lions sit at the bottom of the list when slowing opposing run games. Expect the Cowboys to run, run and run some more. 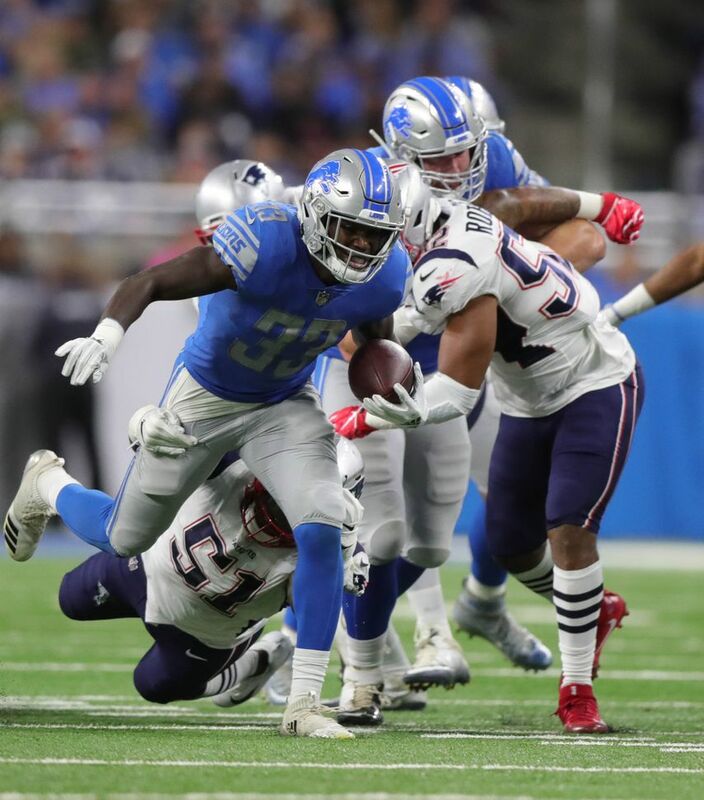 The Lions got their run game going against the Patriots as Kerryon Johnson rushed for 101 yards. Johnson became the first Lion to rush for 100+ yards since Thanksgiving Day in 2013. When handing off to a 100+ yard rusher, Stafford’s game is more complete. In fact, in now his 10th season, Stafford has only had eight 100+ yard rushing efforts from a back, including Johnson’s from last Sunday. In those games, Stafford and the Lions are 7-1. Sitting out for the third consecutive week for Detroit will be defensive end Ziggy Ansah (shoulder). Offensively, the Lions will be without tight end Michael Roberts (knee). Wide receiver Golden Tate (hip) and Jarrad Davis (knee) are listed as questionable. For Dallas, their defensive unit will be less fierce as linebacker Sean Lee (hamstring) and defensive tackle Maliek Collins (knee) have been ruled out. Offensively, Cowboys’ offensive line continues to miss center Travis Frederick (illness). Defensive tackle Antwaun Woods (groin) and wide receiver Cole Beasley (ankle) are questionable. Elliott rushes for two touchdowns, but Lions win, 33-27. The first half ended 17-7 in favor of the Packers. Despite a TD catch by Laquon Treadwell, the Vikes looked rather lifeless, to be frank. The second half is where things really pick up. Stefon Diggs played a huge role, catching two critical TD passes and a two-point conversion. Late in the 4th quarter, Kirk Cousins appeared to be intercepted, but it was called back due to a Clay Matthews roughing the passer call. This was a questionable call, as it could have gone both ways. If I were the ref, I probably would not have called it, but hey, I’ll certainly take it. Cousins made them pay, driving the Vikes down and scoring, thanks to a one Mr. Stefon Diggs. He also caught the two-point conversion which made it 29-29. With 37 seconds left, Aaron Rodgers (the Magician) drove the Packers into field goal range (where’s the defense??). It was a 52-yard field goal and the Vikes iced Mason Crosby. It worked, the second time he missed wide left. + Laquon Treadwell had some key drops in this game, his days in Minnesota are numbered. + Kirk Cousins played like an $84 million guaranteed QB, throwing for over 400 yards and three touchdowns. Convinced me. + Hasta la vista, Daniel Carlson. + The NFL needs to change the OT rules to college football rules. It would be much more fun and exciting. Nobody likes a tie, except the Cleveland Browns. + Next week, we have the Buffalo Bills at US Bank. Let’s go and take care of business. The Chicago Bears have defeated the Seattle Seahawks 24-17 at Soldier Field for their first win of the season. It was also Matt Nagy’s first NFL win as a head coach. This win certainly helped Bears fans wash a bit of that sour taste in their mouths after the heartbreaking loss to Green Bay the week before. In total the Bears recorded six sacks, a pick-six and held Wilson to under 250 yards. Danny Trevathan had two of the sacks and rookie Roquan Smith had seven solo tackles, which led the team. Khalil Mack recorded a sack and four solo tackles. Mitch Trubsiky and the offense was on and off. The first offensive drive of the game was incredible and led to a Trubisky to Trey Burton shovel pass for a touchdown. They did not find the endzone again until the fourth quarter when Trubisky rolled out to his left and fired a 10-yard pass to rookie Anthony Miller. Overall the young QB went 25/34 with two touchdown passes, two interceptions and 200 yards. A number of his passes were off the mark, but he also made some very nice throws in the scoring drives. Still plenty of work to do with him, but hopefully he can build on it. A nice thing for Bears fan to see was the energy at Soldier Field. There has not been a lot to cheer about on the shores of Lake Michigan the past few years, but the crowd was in the game the entire way and very loud. Bears fans will likely show up in droves next week in Arizona as they take on the Cardinals. The Detroit Lions (0-1) are on the West Coast to pay a visit to the San Francisco 49ers (0-1) @ Levi’s Stadium. You can catch the action on Fox 2 or on WJR-AM 760 in Motown. Kickoff is set for 4:05 PM ET. Monday Night Football was disastrous in Detroit, at least for one side. Matt Patricia’s Lions certainly didn’t start the season on the right foot. The 49ers didn’t win either, but they didn’t walk away from the stadium that night with their tails between their legs. Matthew Stafford is coming off the worst performance of his career as he completed 27-of-46 passes for 286 yards, one touchdown and four interceptions. Not to mention, No. 9’s signs and signals were being picked all night long. With it being a shortened week, for Detroit’s sake, hopefully offensive coordinator Jim Bob Cooter and Stafford have things figured out. On San Francisco’s side of the field, they gave the Vikings a run last Sunday in Minnesota, but Jimmy Garoppolo wasn’t all that great in the losing effort. The 26-year-old quarterback was 15-of-33 for 261 yards, a touchdown and three interceptions. He’ll have to clean it up a bit as well. Though, it will be interesting because Detroit’s defense allowed a rookie in Sam Darnold to have a rather strong debut in their own building. Garoppolo, who is familiar with Patricia’s defensive ways from their days in New England together, has more experience than Darnold. Getting to him in the backfield would help, but that’s been a struggle for the Lions in recent times. It might not get any easier this time around. You can make the case that San Francisco is stronger with protection up front than the New York Jets, but they’re battling a few injuries. Potentially evening that out, if Ziggy Ansah can’t dress due to his shoulder injury, it could be a low pressure afternoon for Garoppolo. Garoppolo won’t have Marquise Goodwin to throw to as he’s out with a quad injury. Last Sunday, he connected with tight end George Kittle on five occasions. You can expect a similar nine targets in his direction. Detroit’s offense will be without T.J. Lang up front and could potentially be without LeGarrette Blount as well. Both guys are nursing back issues. At least five of San Francisco’s defensive players missed time at practice this week due to ailing injuries. Only two are listed as questionable for the matchup, safety Adrian Colbert and linebacker Malcom Smith. Matthew Stafford puts together a solid day, but the Lions fall short, 27-24. Robbie Gould with a 49-yard field goal to win it in the waning moments. 20 seconds into the game, the Lions had a lead and Ford Field was rockin’. Quandre Diggs’ pick-six delivered by rookie quarterback Sam Darnold had the city feeling good about its chances on Monday Night Football. Matthew Stafford threw four interceptions, Matt Prater missed a 44-yard attempt, Detroit’s running backs combined for 39 yards on the ground while Ziggy Ansah and T.J. Lang left with injuries. Detroit’s first offensive drive looked far too familiar as they went three-and-out. The Jets responded quickly as they flew down the field and found the end zone on the fifth play of their drive. On third down on the pursuing drive, Matthew Stafford threw his first of four interceptions. New York’s kicker Jason Myers chipped in a 35-yarder to make it 10-7 to start the second quarter. Shortly after, Robby Anderson reeled in a pass from Darnold and took it to the house for a 41-yard touchdown. Prater brought Detroit back within a score before halftime as he notched a 21-yard field goal after a 10-play drive. The Lions were the receiving team to open up the second half. Golden Tate tied things up with a 24-yard touchdown, concluding a four-play, 75-yard drive. It was a game, until it wasn’t. It wasn’t long before the Jets stormed down the field, left and right. Nothing was going right for Detroit. In fact, when the opposing team knows just about everything you’re about to do, chances are, things aren’t going to go your way. After a shotty preseason, last night’s performance was an absolute nightmare that came true in the worst way possible, in front of a national audience. Week 1, an absolute kick to the groin. The New York Jets visit the Detroit Lions for Monday Night Football @ Ford Field in Detroit, MI. You can catch the action on ESPN or on WJR-AM 760 in the Motor City. Kickoff is set for 7:10 PM ET. After cringe worthy preseasons out of the Jets and Lions which led to 1-3 records, both football teams are chomping at the bit to get off to a good start in the regular season. 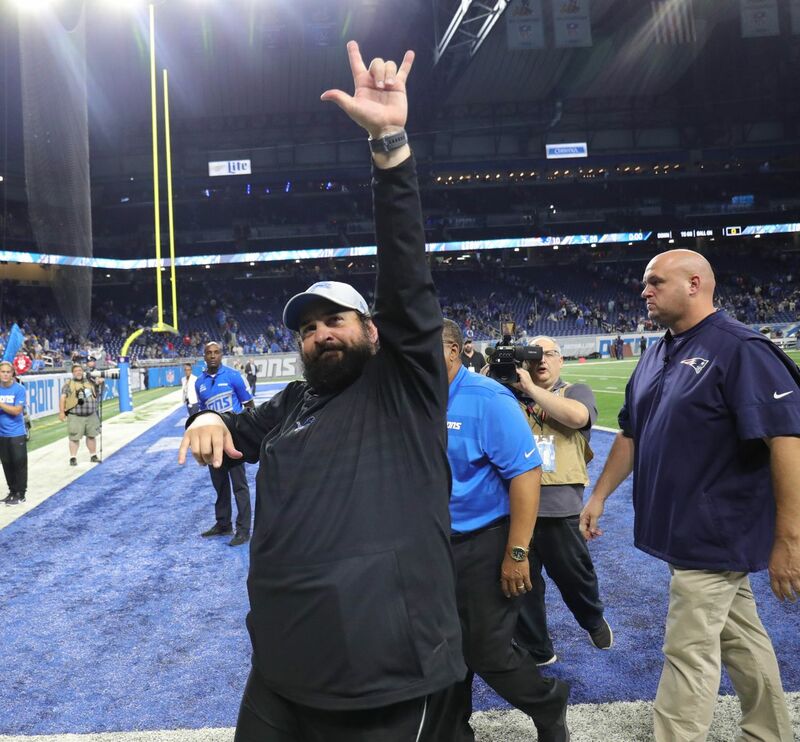 Matt Patricia is entering his first season as head coach of the Lions and will be presenting a different running back combination this fall with LeGarrette Blount and Kerryon Johnson. Blount signed a one-year deal with Detroit back in March, about a month before the Lions drafted the 21-year-old Johnson 43rd overall out of Auburn University. That duo is presumably the best one Detroit has had in the backfield in a while and should be expected to be an aid against New York’s defense tonight. The Jets are rolling with the 21-year-old quarterback out of the University of Southern California, Sam Darnold, who was drafted third overall this past April. Darnold is set to become the youngest quarterback to start a Week 1 game during the Super Bowl era. Crowd plays a factor, Darius Slay and Glover Quin with interceptions as Lions defend the den, win 28-17. The Chicago Bears will begin their 2018 season on their biggest rival’s turf in Green Bay Sunday evening. Many eyes will be on first-year head coach Matt Nagy, as well as quarterback Mitch Trubisky, newcomer OLB Khalil Mack and many others. A match-up between Mack and Aaron Rodgers is something football fans will certainly want to watch. The new-look Bears had no doubt the most productive off-season of any NFL team. In addition to hiring a new coaching staff and trading for Mack, they acquired free agent talent in receivers Allen Robinson and Taylor Gabriel as well as signing former Eagles TE Trey Burton, re-signing CB Kyle Fuller and drafting LB Roquan Smith in the first round…just to briefly sum it up. Many holes were filled around the young core of Trubisky, Jordan Howard, Tarik Cohen, Eddie Jackson and Akiem Hicks. There is a lot to be excited about for Bears fans for the future. What about 2018 itself? Can this team with all the new talent make a huge leap forward and be playoff contenders? It is certainly not out of possibility, but at the same time there are reasons to be cautious about the upcoming seasons. This is not to say that I do not believe in what GM Ryan Pace has done, he has made great moves and it will eventually pay off, but 2018 may still be a step in the staircase towards playoff contention. There are many promising, yet unknown pieces on this team. The Bears are dealing with a first-year head coach with a quarterback that only has 12 NFL games under his belt in Trubisky. Last year he threw for 2,193 yards with seven touchdowns and seven interceptions. He was greatly handcuffed by the conservative John Fox offense and no reliable targets to throw to, but he showed promise. Trubisky is a great athlete with a good arm and ability to use his legs. With a full season coming and an offensive minded coach like Nagy and talented targets for him to throw to, he can play at a very good level. Promise is there, but we need to see it consistently. A number of players and personnel fall into this category, but Trubisky is by far the most important asset on the team. Speaking of Nagy, he is in his first year as an NFL head coach. There are a lot of positive things to say about him so far, but again we need to see results in regular season games. With him coaching a lot of young guys with not much experience/guys in new roles (Trey Burton being the anchor tight end for example), there will probably be some ups and downs early on. That is just how it goes with teams building up with young talent and a new staff. One of the most difficult parts of this rebuild is the division itself. It is looking early on as one of, if not the most competitive division in the NFL. Obviously the biggest roadblock has been and probably will be Aaron Rodgers. The Bears have just two wins against the Packers since 2011 and they are finally looking to turn the tide. While Green Bay has shown great weaknesses on the team over the past few years, a healthy Rodgers makes them Super Bowl contenders year in and year out. Chicago is going to have to beat Rodgers if they want to go on a run, not easy by any means. With all of that being said we still have to get to the favorites to win the North, the Minnesota Vikings. Even with Rodgers on the field for the Packers, the Vikings with their elite defense and newcomer QB Kirk Cousins make them very likely candidates to repeat as division champs. Beating that defense is going to be the toughest part and one big test for Trubisky who is 0-2 against the Vikings so far in his career. The Bears have one win against the Vikings the past three seasons. It also is worth mentioning the Detroit Lions and Matt Stafford, who has been a thorn in the Bears side the past several years. They may not be favorites to win the division, but certainly not an easy win. Bears defense playing well will be key in beating the Lions. This Bears team can go in several directions; a reasonable prediction would be around the 8-8 mark. That is a prediction I will personally stick with as the season begins. While there are a lot of unknowns on the team, there is no doubt enough for this team to at least be competitive. Biggest questions are if they can beat their division opponents and how they matchup against teams like the Patriots and Rams. Established players like Khalil Mack, Akiem Hicks and Jordan Howard are definitely should be enough to get you wins against lesser teams, it is all about those tough opponents. Pace is in his fourth year as GM and has been in a rebuild mode throughout most of that time. Now it is time to at least expect improvement more than anything. Now can the Bears surprise the world and go say 10-6 and contend for the playoffs? Sure there is. If all this talent works out and the team is healthy, then they have the potential to have a lot of success. The Bears have lost so many frustratingly close games they could have won the past two years and this is the opportunity to turn those close games into wins. Not to mention we so often see teams for from worst to first on a yearly basis, no reason why it is not impossible for the Bears to do that especially with all the new talent. It just won’t be easy. The team philosophy is there. The winning attitude is there. This offeseason and 2018 regular season will be a huge stepping stone for the Chicago Bears organization. 2019 is a time Bears fans will hopefully be fully expecting playoff berths and playoff runs. The 2018 season should be exciting for Bears fans, however, it seems like there are plenty of reasons to hold certain cautions. Really want to finally see results on the field and not just on paper. Enjoy the ride and hope for the best.